We are so incredibly lucky to live in a city rich in talent, diversity, and culture. As a small business ourselves, we always lean towards "Keeping Austin Weird" by supporting fellow business owners (and our crazy-talented friends). Please #supportlocal and check out our amazing partners in adventure and fun! The World Music School is a teaching/learning venture dedicated to bringing the joy of making music to as many people as possible while helping to bring understanding between cultures from around the world. Jaime Ospina is a gifted musician (as seen in the award-winning band, Superfonicos), and infuses history, geography, and music in a hands-on experience that your kids will love. Firehouse Animal Health Center Austin is a full-service facility providing first-class animal care and customer service. Their approach is collaborative – they will act as an advocate for your pets’ health care issues, and they will make decisions as a team. Through any challenges, they remain with you – guiding and coordinating care as much as possible. Our campers were totally inspired by Dr. Faught and his team! Lakeway Veterinary Clinic is a one-stop shop, offering ‘round-the-clock services for your non-human family. They serve creatures great and tiny, and they believe in the greatness of tiny creatures! Our campers love visiting Dr. Doyle and his team! Carly’s Critter Camp is a family owned and operated petting zoo and animal sanctuary dedicated to saving lives and connecting people with animals. 90% of their animals are rescues or family surrenders. They hope to impact as many lives as possible and teach adults and children alike to love and respect animals of all shapes and sizes. Our campers' personal favorites were the alpacas! While Broad Studios is primarily a fully functional studio for our 6 residents, we are always working to fill our calendar with a year-round workshop schedule that features Broad Studios' own as teachers as well as visiting teachers from Austin and beyond. We teach everything from ceramics to painting, natural dyeing, weaving, jewelry-making, and more. Our campers loved painting with Ms. Shafer! Whether you have a young Andy Warhol or a reluctant artist in your home, they'll love The Little Red Studio! Ms. Vendetti gives the kids an exciting hands-on experience in a small group or 1-on-1 setting. Sign up today! When’s the last time you had Ethiopian food? Or yummy Thai, Columbian, Indian or Greek food? Guess what? Your young chef can have a blast every class discovering how easy and fun it is to cook (and gobble-up!) 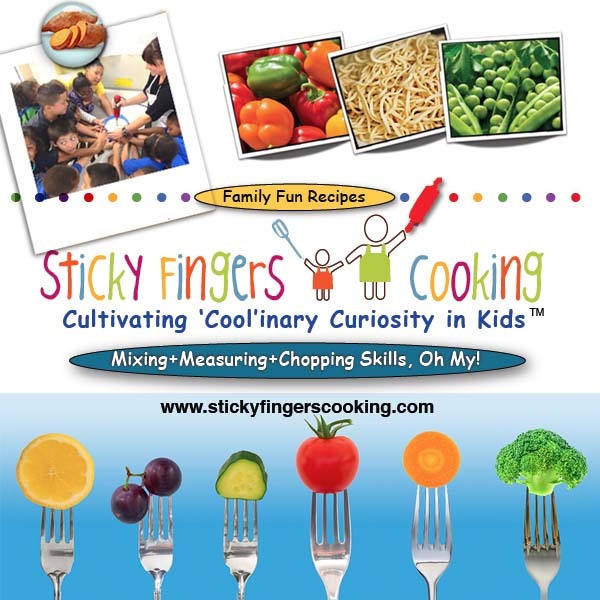 tasty, healthy, American classic and globally-inspired Sticky Fingers Cooking recipes!